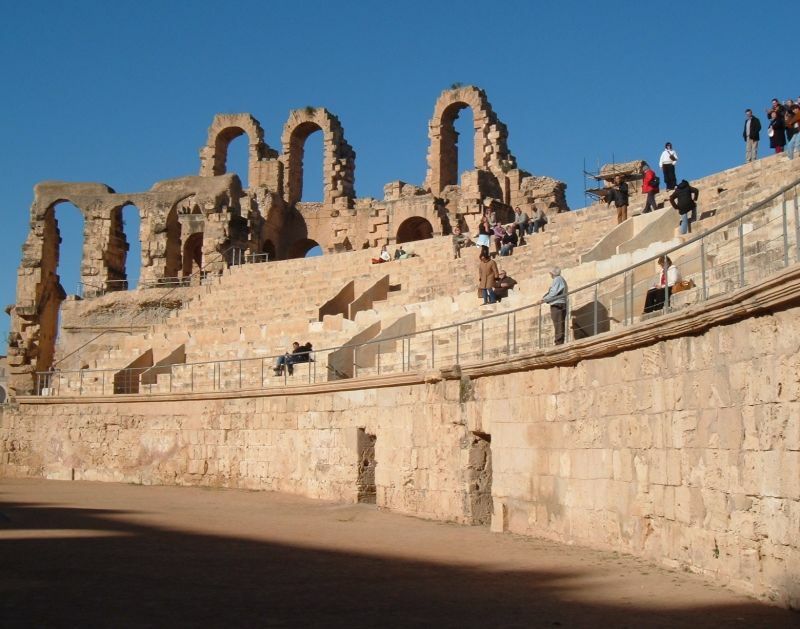 Package holiday hotels in Tunisia tend to be clustered together on beaches out of town. 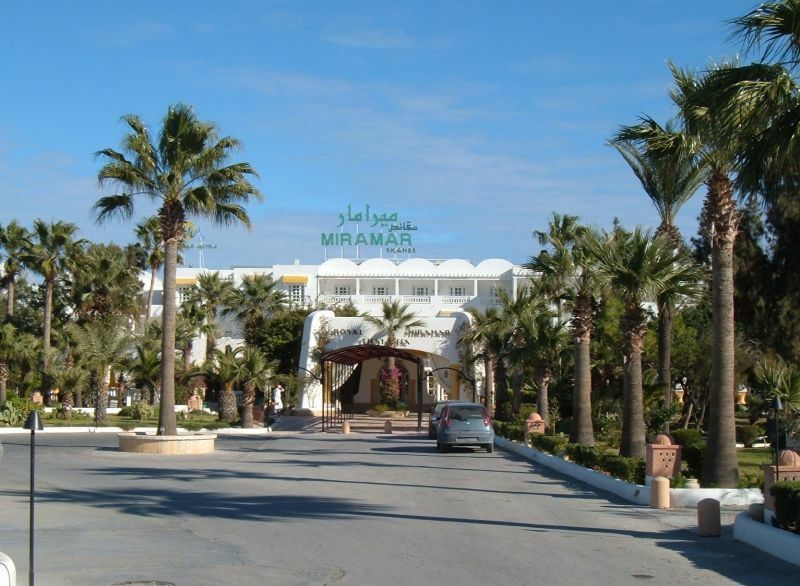 We stayed at the Royal Mirimar hotel which was situated in an area called Skanes on the long beach halfway between Monastir and Sousse. The off-season price was around £20 per night for bed and breakfast, although the hotel gives itself a 5 start rating. Our tour operator was Cardican holidays who looked after us very well. 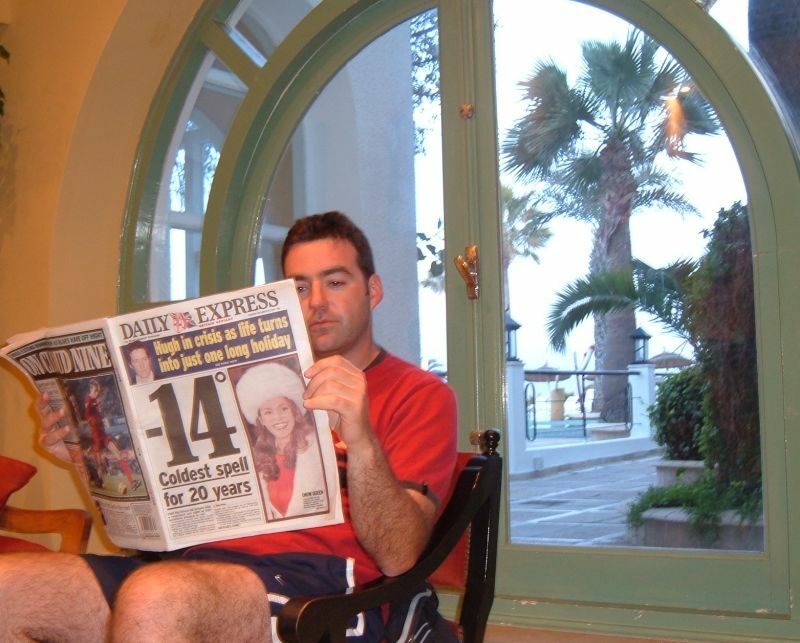 We had a good mix of English and French guests at the hotel. The coast of Tunisia has a Mediteranian climate. 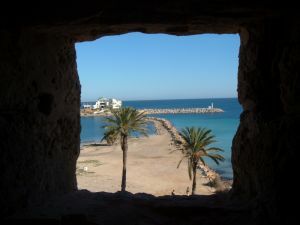 Weather in the low season over winter is similar to late spring UK weather - around 20C during the day. An evening bufet meal is £7.50. 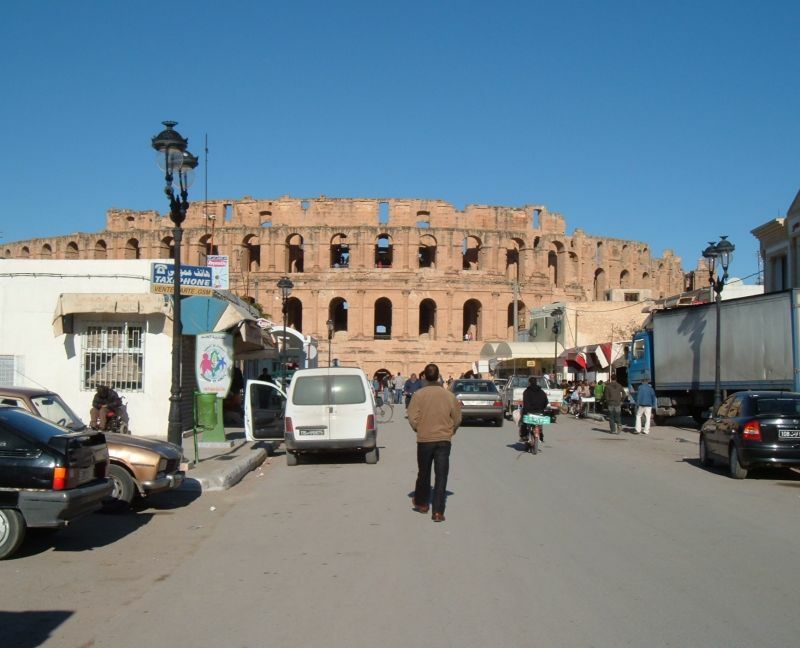 Towering above the town of El Jam is a Roman coliseum to rival the one in Rome. 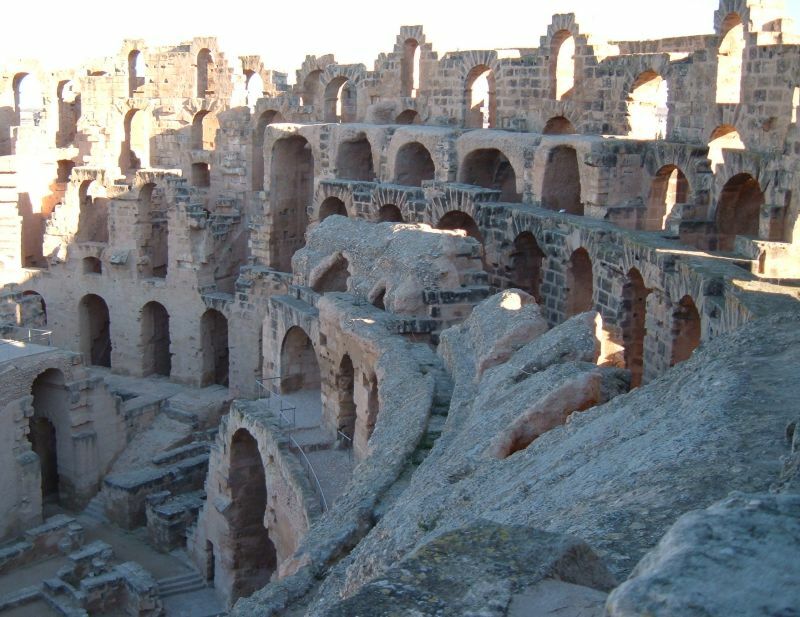 It is not entirely clear why the Romans would have built a coliseum in that area as it is inland (in the middle of nowhere), the soil wasn't great for farming, and there was poor supply of water. The structure is remarkably well preserved with roughly half the structure standing at full height. Steps can be followed to the top. 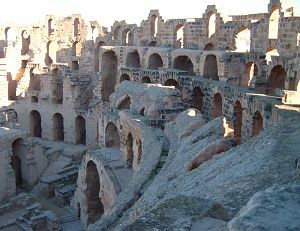 The inside of the coliseum would have been covered in seating, although the arch and rubble structure that held the seating has mostly fallen down. A model of the coliseum shows a roof apparently made from wood and cloth giving the coliseum the look of a modern stadium. Seating has been sensitively reconstructed on one side of the coliseum, the new construction not visible from outside. 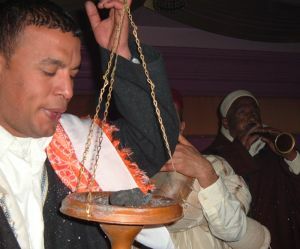 The south of El Jem contains the excavated remains of Roman merchant houses, together with a museum housed in two houses that have been rebuilt. 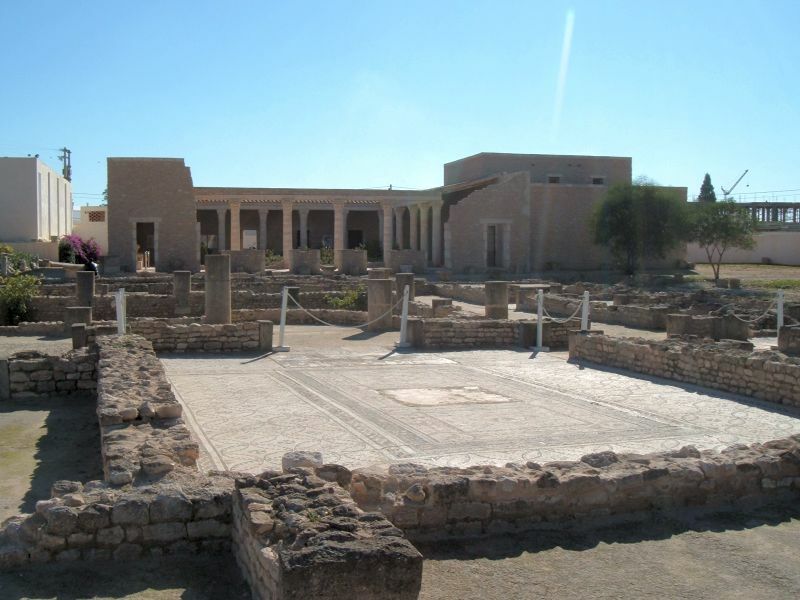 The mosaics are very well preserved, and mosaics from El Jem can be seem in museums around Tunisia. 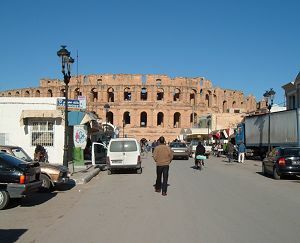 El Jem has a second coliseum! This earlier structure was formed by digging a large hole for the center and piling the earth on the sides to reduce the amount of stone needed to complete the structure. It's across the road from the museum (above) and you can walk up the train line back to the station from there. 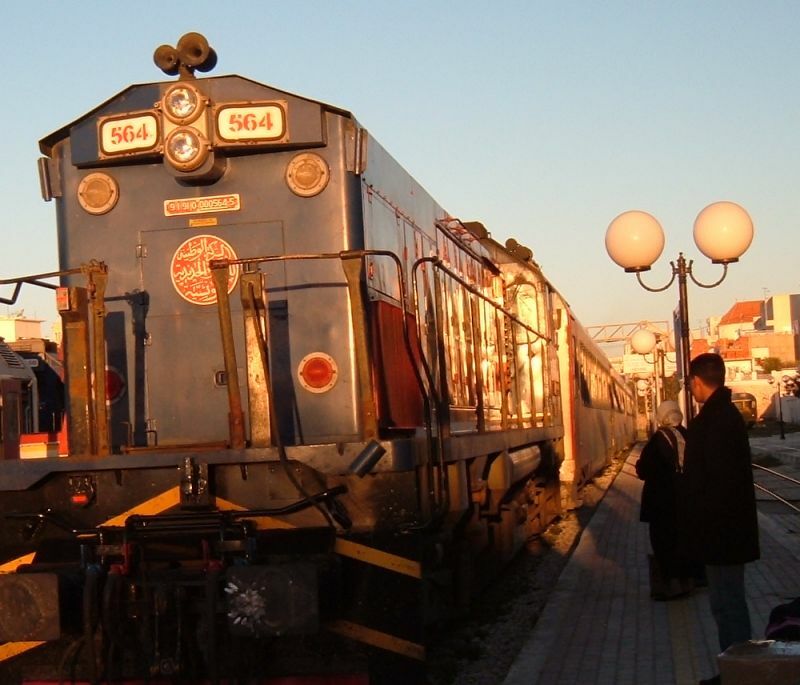 We took the train from Monastir to El Jem. On the way back the train was full and we stood in the area between the carriages. The train had automatic doors to the outside and one of these doors had failed to close. It was a wonderful feeling to sit beside the open door, enjoying the sunshine, the excellent view, and the cool breeze as the train rattled along. The main attractions in Monastir are a Ribat (fort) built in the 9th Centuary. 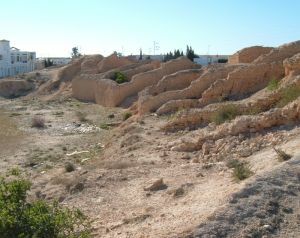 Part of the Montey Python film "Life of Brian" was filmed at the fort (The Biggus Dickus scene). 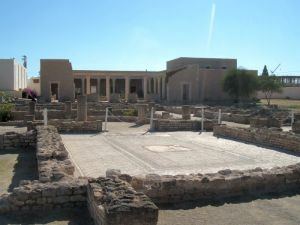 The fort houses a museum of Roman remains. 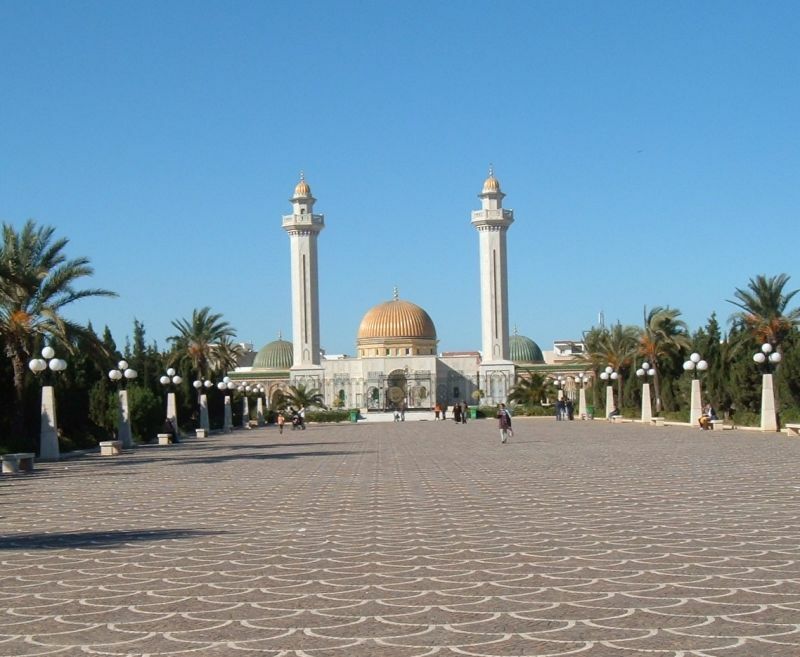 Monastir has a number of coffee shops, but fewer resturants. The town dies at about 7:00, with even taxis becoming something of a rarity. It was cold, windy and deserted when we left the resturant. A couple of kids on a moped asked us for a cigarette, and we offered to give them one of they found us a taxi. The moped belted down the road weaving around shouting at the taxi. The town contains two hotels- a plush one near the harbour and another on the beach. We drank at the hotel on the beach and do hope they get around to cleaning the toilets before high season. We had a pleasant meal at the resturant in the medina, but we heard a lot of good reports about the Pirates resturant by the harbour which generous seafood meals. 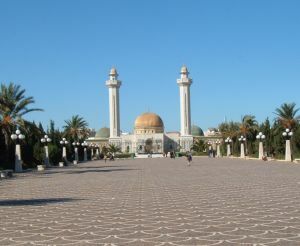 The first president is interred in a mausoleum in Monastir (together with his family). It appeared closed when we visited, but the side entrance turned out to be open. For a few dinar the curators will unlock the doors to the burial chamber and gallery and act as guides. This Medina is much like others in the area - The shops are crouded with goods and shop keepers wait by the enterance - much like spiders awaiting their prey. No medina price is fixed. The asking price depends on how gullable the customer looks, and the selling price after bartering will normally be anywhere between 1/5 and 1/2 of the starting price. 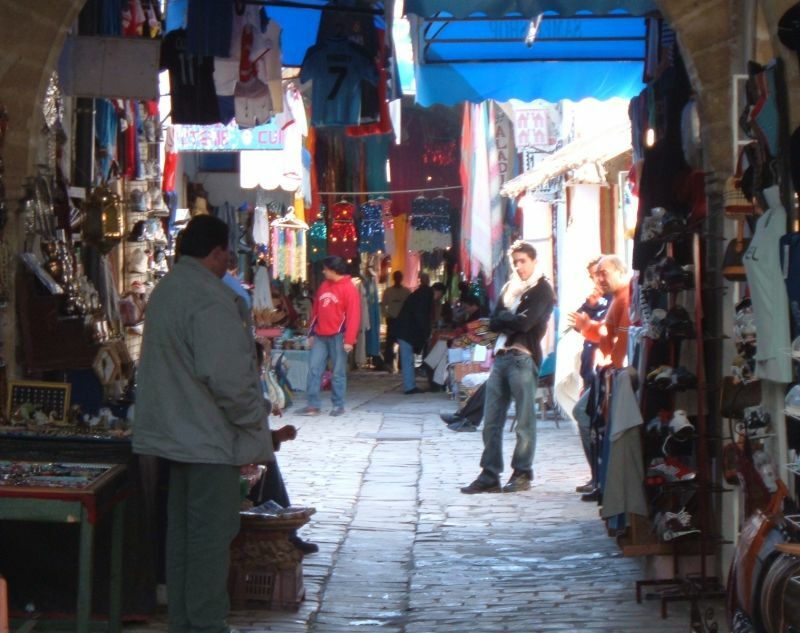 lots of shops sell the same products so it pays not to buy at the first. 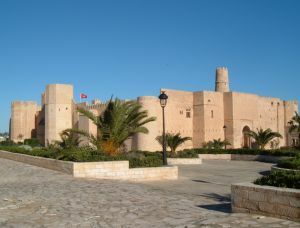 The rabat in Sousse is well worth a visit. 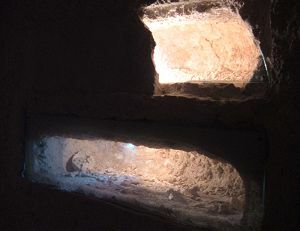 Catacombs can be found to the south west of the town. They house Christian settlers. The catacombs extend for around 1km, but only 100m is viewable by visistors. A few graves have been exposed and the skeletons can be seen. An archiologist can take visitors around some of the catacombs under restoration in exchange for a few dinars, and it is interesting to see the original unrestored graves. This tour is unofficial. Bonapartes resturant in Sousse is an entertaining if expensive. Every now and again through the evening romanian belly dancers or musicians would appear. The bar downstairs is filled with bohemium types, and is a relaxing place to be until after midnight when the music is turned up and the bar becomes a night club. We returned to Bonapartes for New Years Eve. The resturant was lively, but unfortunately the bar downstairs, normally a hang out for Bohemiam types, had turned up the volume to full nightclub mode.